Imperfectly Painted: Spontaneous Saturday: I'm An Introvert. Here, here! I've spent years listening to people tell me that I need to be more outgoing, that I need to talk more, that I need to express myself. Trust me, I express myself plenty. But I'm not a social butterfly, I never will be, and I'm not the type to talk just to make noise. It takes all different types to run the world, and I wish that people would realize that it needs us shy, quiet, observant types just as much as it needs the charismatic leaders that spend all their time in front of the cameras. I used to identify solely as an introvert but now I'm not so sure. I don't let a lot of people "in" persay but I can be quite loud, obnoxious, and flamboyant. Sometimes I think it may be a defense mechanism, give them something silly and superficial to focus on so they don't want to dig deeper. I say as long as your comfortable in your skin then who cares about the others. Better to have a small, super tight knit group of people than thousands of acquaintances. Introversion can be SO misunderstood! I identify with all that you posted (and Jen, your comment, too--I am the same way if I'm REALLY tested). As an introvert, I often word things wrong, too, with people (and then fixate on what I said and how it was taken for WEEKS afterward, in fear that I offended or made the person think I was being stand-offish or something). I have always been this way, but for the most part, had teachers who were VERY understanding. Friends? Not so much, until middle school, when I found my best (other introvert) friends. Here's hoping that more people begin to understand that introversion isn't bad, just different. And like Sheena says, it takes ALL of us to make the world go round! I'm definitely extroverted. Which can sometime be overwhelming to some people. And I get that. When I meet people I try and tone it down till I can figure them out a bit. I'm not exactly hugely social. I have lots of friends and acquaintances. But only a few really close friends. And I like it that way. I do a lot of performing so you kind of have to get out there and talk to people because knowing how to network is huge. 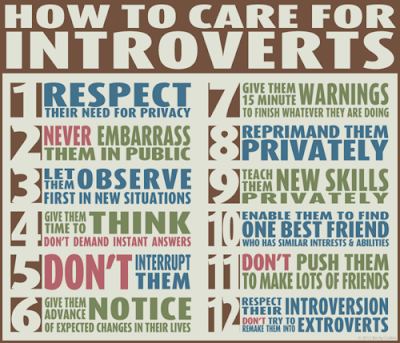 But as an extrovert I still try and keep others in mind. I have a few introverted friends and I love them to death. I think I'm somewhere in the middle, or a bit of both if that's possible. I'm a Gemini so sometimes I feel like I have a split personality, lol. I'm an introvert for sure, so I relate to everything you wrote. I've always been shy and I've never been one to have a huge group of friends. Over the years, I've heard my fair share of comments from people, mainly family, about my amount of friends and the fact that I should go out and make some more. Sometimes I do wish I was more outgoing, because there are times when I almost feel weird for being so shy and anxious about social situations, but that's just how I am. I can open up around people that I know and am comfortable around, but even then, I'm never the most outgoing of the group and will never be. I think it's easy for people to judge when they can't relate and don't know the full extent of the situation. I've always been described as an introverted extrovert or an extroverted introvert, which is quite contradictory. I think It's really more that I'm on the border of introvert/extrovert, leaning towards extrovert, but with my anxiety issues, it often makes me more introverted. I'm happy in groups of people that I know, most of the time. A lot of the time I just want to curl up with a book and my poodle. I love blogging because I feel I can talk and interact without the same pressure as face to face. You're not alone :) *hug* thank you for sharing! I feel you Phyrra! I love talking to people and I'm not particularly shy so I am extroverted, but I also have many introverted qualities. Maybe you are an extrovert who is comfortable enough with herself to not be afraid to be alone. I'm an extrovert, so I'm glad you don't have anything against us! lol. I'm married to an introvert, though, and they do look at the world differently! thanks for posting this. 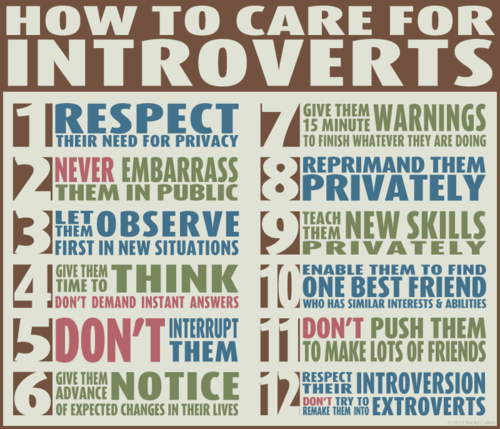 i relate to almost all of this, i have always been introverted. there have been moments in my life where that wasn't the case, but overall, it is. i find so much inner peace being alone and doing my own thing...I'm one of those people who just never gets cabin fever and I don't need to be watered like a fern. It always annoys me when people or family tell me "you need to get out" if they think I've stayed inside too long, like just because they like to be out and about and doing things, I should too. I got lucky in that my boyfriend is almost exactly like me. We both hate the heat and just prefer to hang out with each other and do our own thing. Good for you to say it loud and say it proud - it bugs me so much when other people try to mold you into something else instead of just accepting you the way you are. Excellent post! My now husband asked me out two times and both times I said no. He is very good looking and was the star of our high school baseball team and a lot of my friends had a crush on him. I ran into him a few times at parties and thought he was stuck-up. He didn't say alot and just kind of watched from the sidelines. He asked me out a third time and I said yes just to get him to leave me alone. That date was 18 years ago and we have been together ever since. What I thought of as stuck-up was actually extreme shyness. I am an extrovert as is everyone in my family so shyness was a whole new world to me but our introver/extrovert relationship works! I'm an introvert. This works well as a teacher. I put on the mask of extroversion for work and leave it at school at 3pm. This means I can automatically compartmentalise my life and find it easy to switch off. I keep my real self to myself and my family. I don't share that. But I have some energy to give to others and, whilst at work, I give it in full measure. Then I stop and become myself. I'm very happy. It works. Thank you for your post. I could relate to all of it. I am the only introvert in a family of extroverts and from early on received subtle (and sometimes not so subtle) messages that there was something wrong with me. My parents and many of my teachers simply didn't know how to recognize and nurture the strengths of introversion. I think the aspect I struggle with most today is really wanting to make connections with people but being an intensely private person who has difficulty expressing my thoughts and feelings. However, if someone has the patience to let me open and warm up at my own pace, like you said, watch out. There is a very dynamic person dancing beneath the apparent reserved surface. In the same way that I write prose and poetry to express myself, I have taken to Facebook as a way to share myself and to nurture my connections with others. It does not replace the intimacy of direct interactions, thus becoming a way of avoiding contact, but rather enhances the expression of myself and the quality of my connections with others (particularly those who are not near). I am mainly an introvert too, if the mainly part makes any sense. I was PAINFULLY shy as a child and probably right through my teen years (I remember talking on the phone to one of my first boyfriends and not saying a single word to him...he'd actually have to say things like, "Why don't you ask me how football practice was today?" to try to encourage me to talk. It was that bad. My Dad, however, is an extrovert. He talks to anyone- and I find that as I get older, I do the same. Guy at the grocery store stocking the freezer section? Let me strike up a convo with you about how lucky you are to be working in the freezer on such a hot day. Woman and her daughter walking by my car in a parking lot? Let's have a 10 min convo about how your daughter accidentally wore 2 different flip flops today. Cashier at the pharmacy? Allow me to engage you in a discussion about how Luvs are my favorite diapers (she was probably hoping that she'd get another customer just to shut me up). Maybe it's the whole nature vs nurture thing? Cuz' I was definitely born an extreme introvert. Have you ever take the Meyers-Briggs personality test? You can find free ones online, I'm pretty sure. I found that to be so fascinating. I am an "INFP", which is Introvert, iNtuitive, Feeling, Perceiving. It is so cool to read about interacting with the different "personalities" once you find out what people around you are too. I totally agree that introverts are misunderstood! I'm an INFP as well. Like you I can be very warm and chatty with strangers and get a sense of well-being from these brief encounters. I also love to dance and sing and have no problem getting up in front of a crowd to sing karaoke or dancing if there is no one else on the dance floor. But when I really want to share myself with someone (whether it is just as friends or something more) I suddenly go blank and find it difficult to find the words. Consequently, I am sometimes perceived as aloof, uninterested, and snobby when the reality is so far from this. i know the feeling exactly! every word of this describes me as well! but we will be okay, as long as we make people aware of how we function and interact. and this blog is helping us do that! so thank you :) sharing to facebook! Wow. Perfectly said. I love this part: "The busy and exciting outside world of an extrovert is what an introvert has on the inside." Thank you for writing this blog and sharing! I am thankful for recent efforts to understand and accept introverts. I recently read a wonderful book that I highly recommend called "Quiet" by Susan Cain. Very validating and empowering. TBH, I was never sure where I fell, but when I read that list those are all things that are SO important to me and I wish people would do for me!! Lovely post. I was the same and I read "The Introvert Advantage" and finally understood exactly what I was and that is was OK! That was only about 6 years ago and I"m 54 now! I also second the book "Quiet" by Susan Cain. I'm not sure. I mean, I have anxiety/fear of going to events, like, sometimes I'll end up physically ill from stressing over them, but in the past year I've been making myself go and do them. Then I have a good time. After the event, I'm exhausted, sometimes even the next day I'm exhausted from it. I test as an ENFJ on the Myers-Briggs tests. So I enjoy time with people, but also time alone. Yeah, I think you hit on the head with the INFP's Lauren! When it's reeeeally personal about ourselves is when we clam up the most! I was called a snob most of my life and it is the furthest thing from the truth! I remember my best friend told me that her mother had said that she (her mother) didn't really like me and that you had to "watch out for the quiet ones". It was hilarious because I was the "good girl", who listened to my parents and was afraid to do anything of out line, and my "best friend" (which, looking back, why would she tell me her mother didn't like me?) was the boy-crazy trouble maker! I feel like this describes me to a T! I'm an introvert and hardly anyone but those that study what an introvert really is knows this. I just play well with others and appear to be an extrovert. But, I love my own company best of all and bore quickly of those that go on and on about themselves in a social setting. The world got a bit more tolerable when I quit trying to judge others and just stayed with working on myself being happy and doing what I like. Many think introverts are just shy but it is more complex than that and I think that can be hard for extroverts to understand.